My friend Andrew and I had had been trying to get out canoeing together on New Brunswick’s famous Cains River since Spring 2013. When he informed me at the start of June that he had to use up all of his vacation days by July, we knew it was time. June 12th he was in my driveway at 5:30 a.m., ready to hit the road – while I was still upstairs in my underwear of course. Our plan was to spend two days paddling from the bridge at Grand Lake Road (also known as Highway 123) into the Main Southwest Miramichi River and down to the municipal park in Blackville. Approximately 60 km in total. 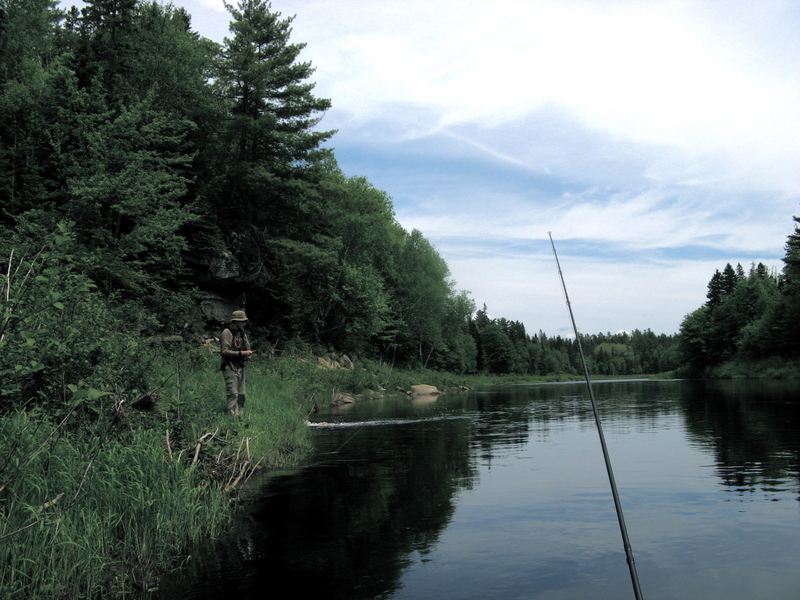 The Cains River trip is a popular one amongst New Brunswick fisherman because it is famous for its fly-fishing of Atlantic salmon and brook trout. While the salmon typically don’t run through the river until the fall, the trout fishing was supposed to be great this time of year. I’ve never had much luck fly-fishing – my excuse is I only just got into it a couple years ago – so I was anxious to get out on the water and work on my cast. Note that this does not imply that I was expecting to catch anything! After dropping a vehicle at the park, we arrived at the put-in around 9:00 a.m. The water level looked good, the gauge in Blackville was at 1.36 m. There’s a nice access point with a good place to leave a vehicle just off the down streamside of the road, on the Doaktown side of the bridge. When we arrived – along with hordes of hungry mosquitos – an old fella was down there. “Any salmon in the river yet?” Andrew asked. “Salmon aren’t even in the main river yet,” he scoffed as he got in his truck, evidently repelled by our lack of knowledge. The first thing we noticed after hitting the water was the damage from the year’s ice flows. Many of the trees on the bank – up to 6 ft above the present water level – had their bark stripped off the first 4-5 ft of their trunk on the riverside. The riverbank itself was comprised of mostly lush, green herbaceous vegetation, tall grasses, young ferns, and – as we learned the hard way at our first stop – poison ivy. “Crap, that’s poison ivy” I said to Andrew. “Nah, not here” he replied. “Dammit, I think it is” I said as it dawned on me that I’d just dragged my rope through a large patch of it. I’d heard that the fishing was best on the first half of the trip, so our rods were out shortly after we set sail. It’s always a little nerve-racking to me when two guys with 9ft fly-fishing rods are casting in opposite directions in the same 17 ft canoe – the math just doesn’t add up – but miraculously we both went unhooked. I was lucky enough to land the first fish of the trip, a 6-7″ brook trout with a beautiful, dark body and vibrant blue and red speckles. It took on a blue-winged butterfly in a little eddy adjacent to where a spring flowed into the river. Afterward things went quiet. 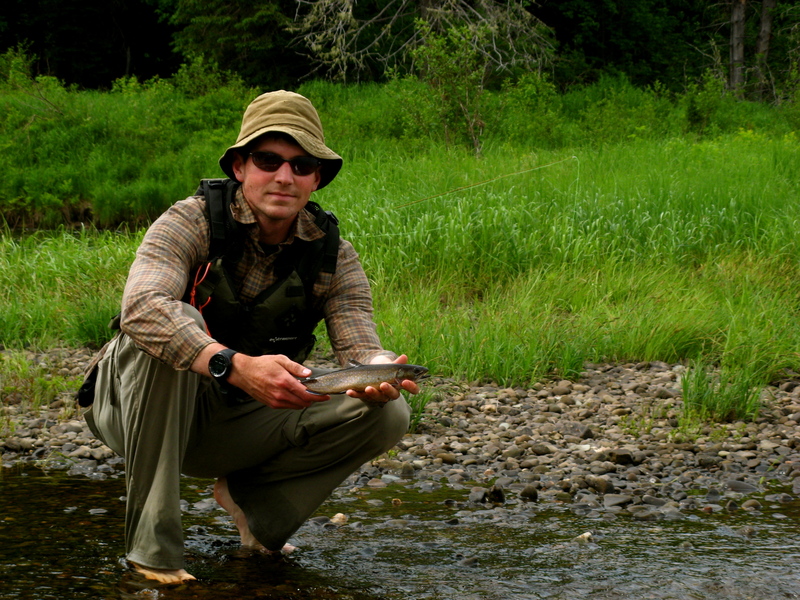 At some point Andrew put on an orange bomber – a dry fly – and everything just clicked. 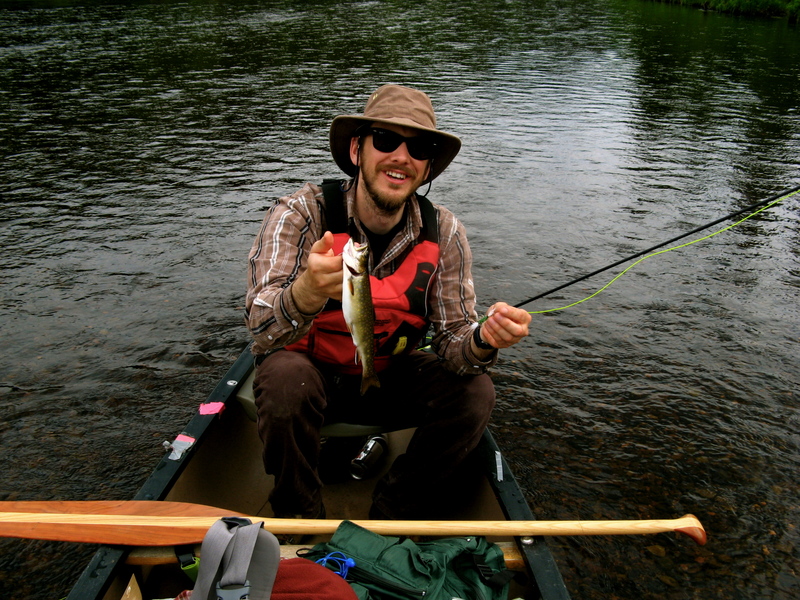 I put on a green one soon after and the 3-4″ trout were plentiful. Our best spot was on the backside of a grassy island in a narrow channel. As we approached, Andrew said “I like the look of that spot, lets get out.” We beached the boat in the rocky shallows above the island and I decided I was in a good dry position to fish from the stern. A drop in elevation at the head of the island resulted in a series of small standing waves – followed by what looked to be a promising little pool. I was in position to fish from the over hanging grassy bank above the island, down into the waves. I worked the bank first, then released some additional line to let my fly drift down through the waves. A 8-9″ trout was there waiting for it on the first pass – talk about exciting! Andrew eagerly walked over to the pool and of course caught a beautiful 12-13″ brook trout almost immediately, and several smaller ones thereafter. Andrew’s trout – there’s no jealously here at all. When the pool went quiet, it was time to make a big push down-river. Our intention was to camp somewhere near the mouth of the Sabbies River – which we estimated to be near the halfway point of the trip. We paddled hard through the old-growth pine, fir, and spruce, past the fishing lodges, through the steep river valleys, and arrived at the mouth of the Sabbies around 8:00 p.m.
Finding campsites on a canoe trip can be a bit of a chore – the grass always seems greener on the other side. Making the decision more difficult is the fact that on a river — a lot like in life — the current only flows one direction and travelling upstream isn’t always possible. Lucky for us, we found a great site on a point on our second try. The spot showed signs of many years of use, few of which were positive. Garbage everywhere, everything from 30-year-old beer cans to recent plastic water bottles – clearly, some people have no respect. We did our best to tidy things up, but there’s only so much you can do when you don’t have any extra garbage bags. If you’re reading this and planning on doing a similar trip, bring a couple extra garbage bags and help keep our province beautiful. 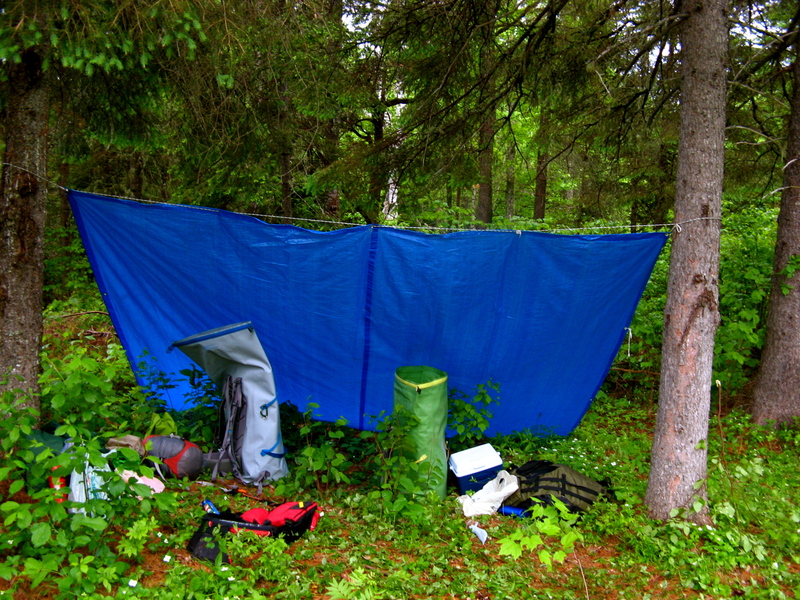 After a night of dreams about the boat floating away, we awoke to a wet tent and overcast skies. With oatmeal in our guts, we were back on the water around 8:30 a.m. As the Cains approaches the Main Southwest Miramichi it gets much slower, wider, and deeper. Much of this stretch of river is flagged as ‘private fishing’ so we were left to observe our surroundings and discuss the pros and cons of ‘private fishing’. While it seems unfair that any water should have access restricted to paying customers only, the conservation benefits are undeniable. It’s in the best interest of guides and outfitters to maintain a functioning ecosystem in order to preserve their livelihood. The landscape was dominated by pines in many areas, red pine, white pine, and even jack pine. Things were so quiet on the river that we drifted silently within 10ft of a deer standing at attention on the bank. Unlike other tributaries of the Miramichi River I’ve been on, the geology surrounding the Cains River is mostly comprised of a grey shale. When exposed, smoothed, stair-like stacks of shale appear on the banks and up the river valley. We hit the Main Southwest Miramichi with the wind at our backs and no need to even touch a paddle. Drifting through, it was hard not to look at the wall-to-wall houses and wonder what it was like 100 years ago. Was it forested or fields? Regardless, it looks like a small municipality today. We landed in Blackville around 2:00 p.m. loaded up the boat, and discussed wetting a line back at the 123 bridge. However, when we were confronted with hordes of bloodthirsty mosquitoes, I changed my mind pretty quickly. Rather, we shook hands, congratulated each other on a well-executed trip and headed back to Fredericton.